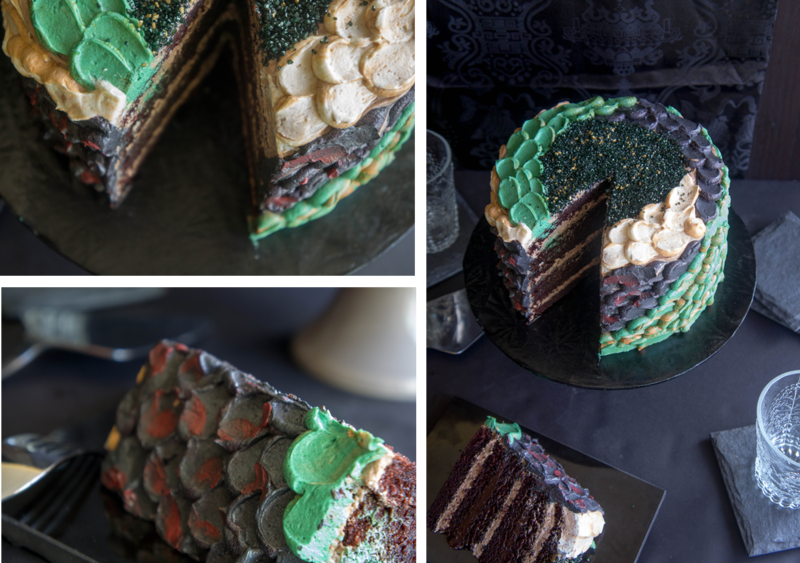 The cake: A dark chocolate cake with dark chocolate chili ganache and milk chocolate cinnamon swiss meringue buttercream. 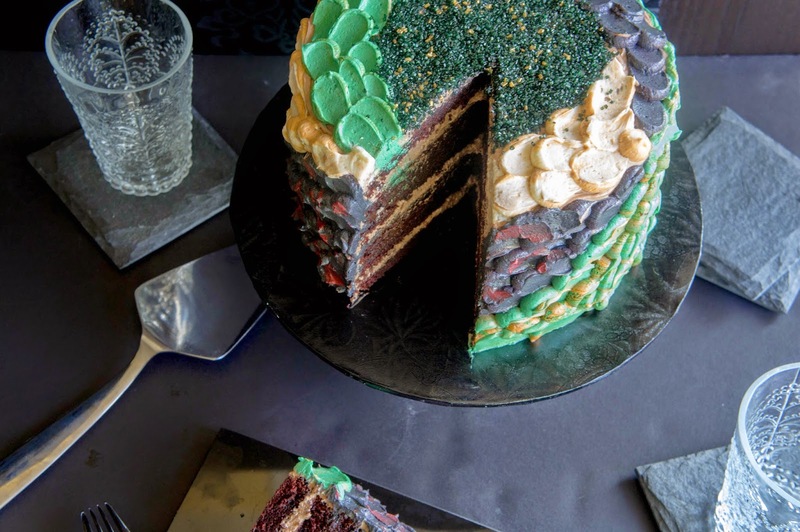 This rich chocolate cake is filled with fiery flavours. The dark chocolate ganache conveys passion and the chili adds heat to the flames. The milk chocolate buttercream is smooth and sweet but the cinnamon adds a spicy kick. I think these flavours perfectly sum up the personality of Danaerys, the one Targaryen we have gotten to know the best in this series. 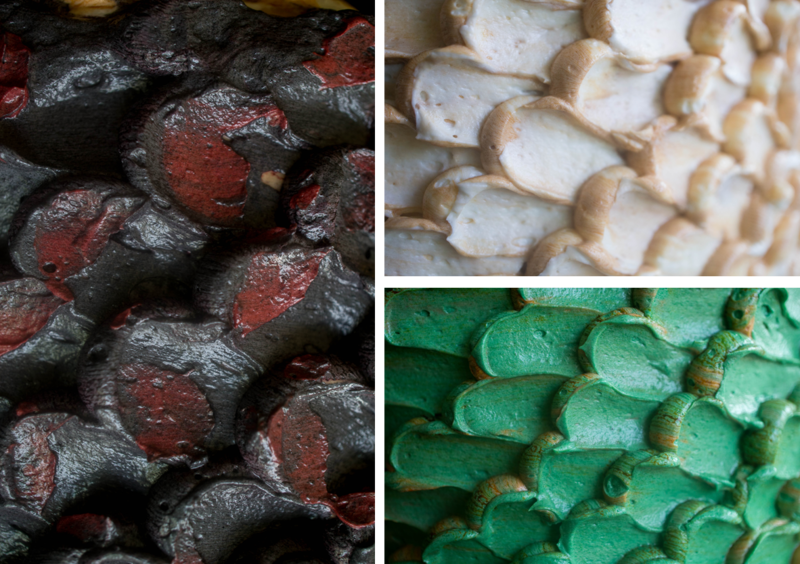 And of course, if there is one thing the Targaryens are known for, it is dragons. 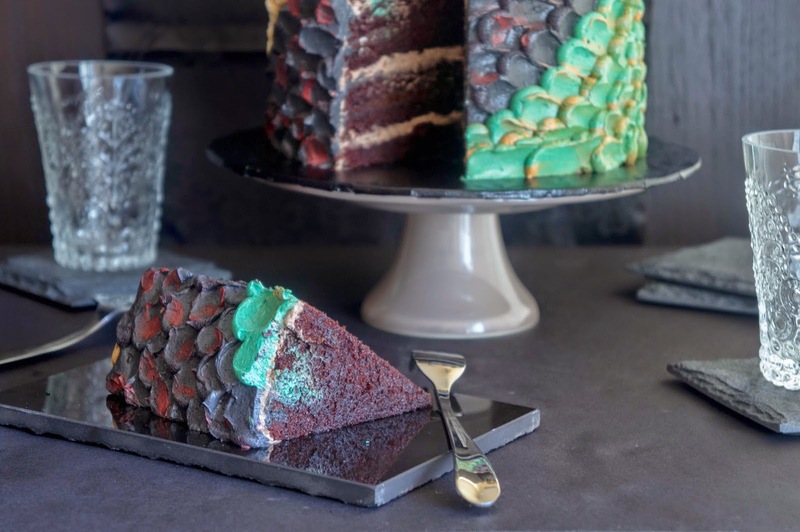 This cake is frosted in dragon scales, representing the three dragons that hatch for Danaerys. One egg was a deep green, with burnished bronze flecks that came and went depending on how it was turned. Another was pale cream streaked with gold. The last was black, as black as midnight sea, yet alive with scarlet ripples and swirls. On top is black sanding sugar, the ash of all the things the dragons have burned along their way. The cake base is my favourite chocolate cake from Sweetapolita but made in 3, 7 inch cake pans to get a smaller, taller cake. I use this ganache frosting recipe from David Lebovitz and added 1 tbsp of chili powder. You have to know your chili powder to estimate this. Some are less spicy than others (also depends how old it is). Taste and add a little bit at a time. You just want a little burn at the back of the throat. It will also tend to get a bit stronger over time. I use my usual swiss meringue buttercream recipe from Sweetapolita and whip in 300 g melted and cooled milk chocolate and 1 tbsp cinnamon at the end. For the scales I used this classic vanilla frosting recipe. I used gel paste colours to try and get the colours I wanted. For the dual colour effect, I “painted” the side of the pastry bag with one colour of frosting and then carefully filled the bag with another colour. Crumb coat with the buttercream and refrigerate the cake for 30 minutes to set it a little so it’s not so wobbly when you try and do the scales. 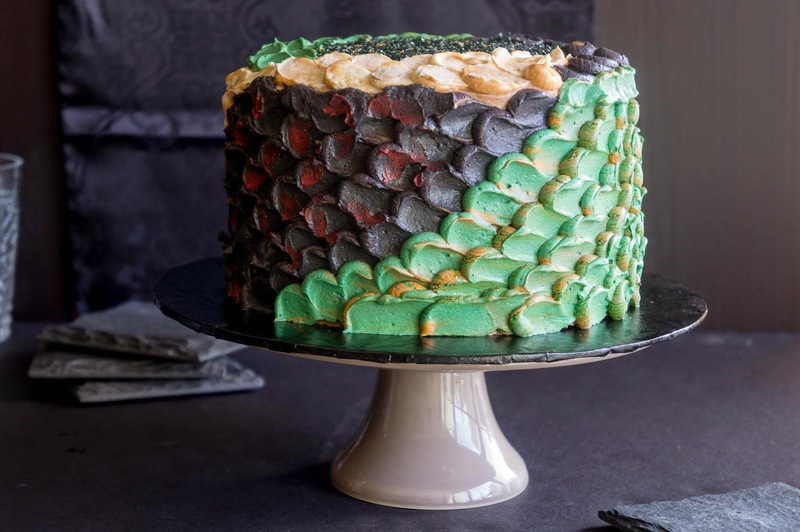 To get the scalloped or “scale” effect, pipe a row of dots using the coloured vanilla frosting with a round tip. Then, using a small offset spatula, start at the center of the dot and spread to one side. Repeat with the remaining dots. Pipe the next row of dots lightly overlapping the parts that you just spread. Repeat until the entire cake is covered. I found this picture tutorial useful. 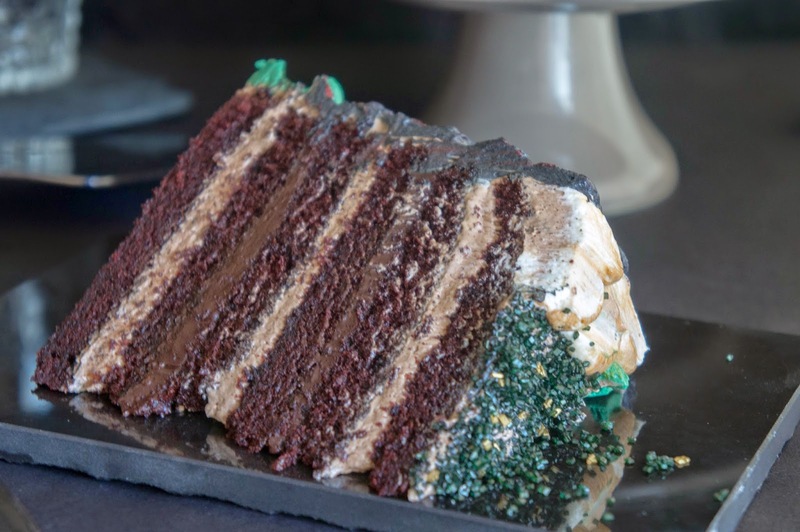 To finish, sprinkle black sanding sugar in the center of the cake along with a tiny bit of gold sanding sugar. I've never watched the show, but this is AWESOME!! Thanks! You should definitely watch the show.. or read the books!